At the beginning there was … a cottage, which had caught the eye of King Max 2nd’s eye whilst hunting in the Ammerwald. At the beginning there was … a cottage, which had caught the eye of King Max 2nd’s eye whilst hunting in the Ammerwald. He sent for Friedrich Ziebland, who had previously refurbished Hohenschwangau. The cottage was enlarged, in a style popular with nobility and royalty at that time and became the King’s cottage in 1869. By that time he was Crown Prince, later to be Ludwig II had visited his father Max II. in Linderhof. 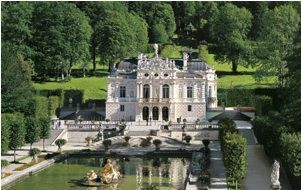 He was particularly enthusiastic about the Castle because of hunting and ordered that Linderhof should be equipped with all the fineries popular at that time. The court architect Dollman sought to develop the building further and added some extravagant ornamental plasterwork. 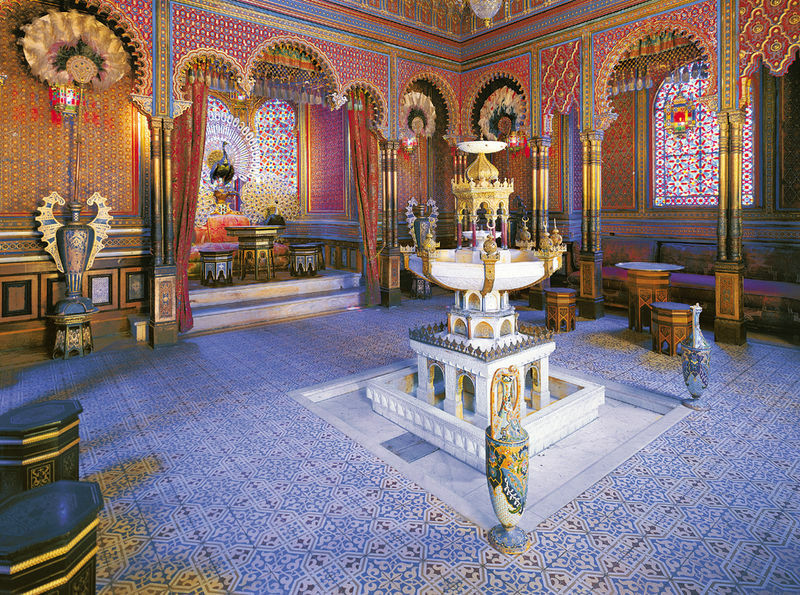 At the end of 1872 the royal residence had been completed. A timber-frame construction on the outside, the interior was made from finest rococo and all for a ruinously expensive price of nearly 8.5 Million Gulden – 2 Million more than that of Schloss Neuschwanstein. In 1874 Ludwig signed a decree for removal of the king’s cottage, only the three sided outbuilding should stay there for longer. This is the reason for how came the enchanting appearance of the fairy-tale castle. The exquisite rooms have been furnished in an extremely spectacular style, even for a monarch. It is said that the king let a gentle deer run in the large South Room and it saw herself in the mirror, the deer seemed to think there was a herd and jumped into the middle of the mirror causing considerable damage! In the dining hall you can see the much admired table that Ludwig II dined at was brought up for each dinner from the kitchen and when the monarch was dining alone, he gaze on the portrait of the beautiful Lady du Barry. The king had audacious ideas, even for the whole park. For the grotto latest technical developments were to be used, 24 electric generators from the Siemens Company were placed in the engine house and therefore established one of the first Bavarian electric works. And in addition a rainbow-projector was used to add colour onto the walls. Beside the work of the engineers the interior designers were also very busy: coral candle holders, coral chairs, a throne made from shells, simulated stalactites and the boat, also made from shells. Even the favorite horse of the monarch, which was running wild in the garden and ate the roses, had to wait whilst his Lord saw the grotto’s completion. 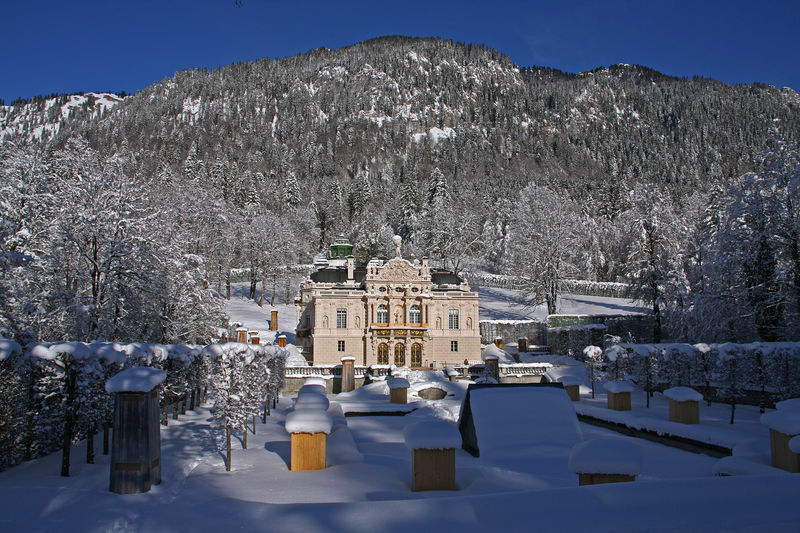 Linderhof is full of such stories and a place where you can give your fancy full range. In winter it is perhaps even more beautiful, when snow freshly fallen is on the castle and the park has its own special charm. The Munich court garden architect Carl von Effner was responsible for the landscaping of the garden and was playing with all themes of the rococo style: a 25 meters high fountain, the cascade, the Neptune’s Font as well as the terraced garden that visitors find so charming. The Hunting Cottage was, in Ludwig’s times, set far into the Ammergau forest, near the Austrian border. It’s design was based upon a stage model for a performance of Wagner’s Valkyrie. But in 1990 it has been rebuilt again at a place closer to the castle. In addition Ludwig bought a Moorish style newsstand from the filed King of Railways, Strousberg. It was taken apart and removed from the Bohemian Park in which it was situated, then transported by train to Weilheim and by horse drawn carriage until it reached Linderhof, where, since the end of 1877, it has stood in the middle of the upper Bavarian alps. And the story of houses being moved goes further, there is also the Moroccan house from the Parish World Fair which was brought to Linderhof and reconstructed there in 1878. 1 x daily free admission to the exhibition "From Lynder yard to the Palace"